Anchor's newest seasonal, Humming Ale hit the package market back in 2010 and slots in as the fall seasonal. Fall beers are usually pumpkin related or malty, so it's always nice to see something that bucks the trend like this American Pale Ale. 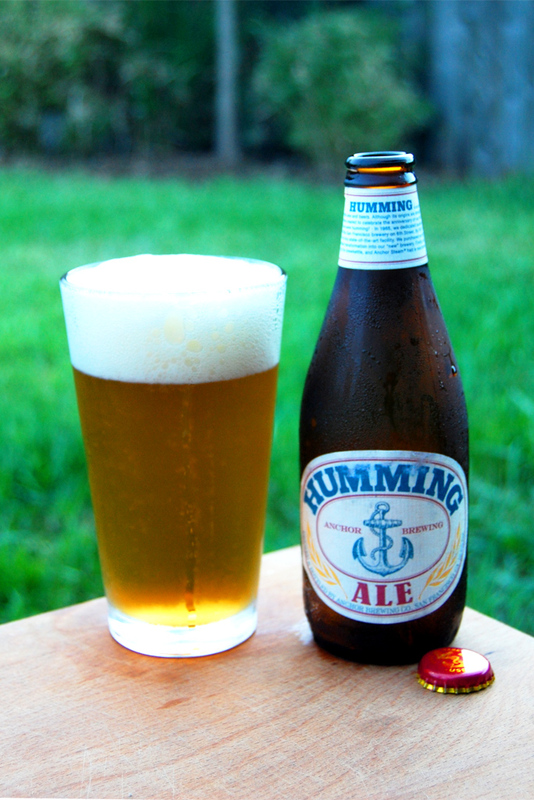 Humming is actually a well-established beer term with ancient roots. Instead of a specific style, it refers to a strong, effervescent beer with plenty of character, or just a damn good pint. As for construction of this particular brew, Humming is built with Two-Row Pale malt and is hopped and dry-hopped with Nelson Sauvin hops. Nelson Sauvin is a relatively new variety (developed in 2000) out of New Zealand with a fruity profile and can be used for bittering, flavor, and aroma. [B]old, frothy, effervescent ale, with hints of citrus. Perhaps it speaks for itself. Let's get cracking and see if this is is really a humming brew. Appearance: A golden body capped by two fingers of creamy off-white head that fades slowly and leaves great patchy lacing. Aroma: Lightly spicy and citrusy hops over a mild biscuity malt body. Taste: Very similar to what the nosed promised, the profile is composed of juicy, delicately spicy, and moderately bitter hops over a calm biscuity malt backbone. Everything is balanced excellently. Husky grain and lingering bitter hops in the finish. Mouthfeel: Medium bodied and a little creamy with medium carbonation and a drying finish. Drinkability: Supremely drinkable, Humming is a great accompaniment to an early fall evening. Verdict: A new Anchor beer is always something to look forward to, and Humming Ale doesn’t disappoint. It has all of the trademark deceptive simplicity, drinkability, balance, and craftsmanship you’ve come to expect from Fritz and the gang. Note: While this review is being published in winter, the tasting notes contained within were taken when the beer was fresh in fall. Today, I went out of my way to purchase some Anchor Steam, which I had a hankering for and headed for a local stockist which usually carries the brand. Instead I found both my very dear old favourite, Liberty Ale, and a new (to me) product called Humming Ale. I purchased both and headed home, eager to savour the familiar and sample the unknown. I allowed the beers to chill for several hours before opening. Now, let it be known that I have official beer tasting credentials from both the AHA & CABA, have brewed for years, participated in high profile beer judging events, and, have had a profound love for Anchor Steam, and especially, Liberty Ale, since the mid '70's. Anchor having been discovered in New Hampshire in a rural bar full of Loggers on a dreary night returning from a fall motorcycle tour of New England, and Liberty while returning from a business trip to New York, taking the "liberty" during a flight delay to impatiently sample the 6 pack of carry-on Liberty at the airport bar. I am unable to forget the huge hop aroma that escaped upon opening that first bottle, and the knock-out punch of the hop & malt taste that followed. The concern of being discovered, consuming these beverages in the dark corner of an airport bar, did not dissuade me from the pleasure of the moment. Anyway, from early on I have come to love and charish these beers but must admit that while the Anchor Steam has maintained its character over the years, the Liberty has not; this once great American Pale Ale has, in my grim opinion, been seemingly neutered, civilized and groomed for the common beer drinking public - today's version sadly bears little resemblance to its bold, distinctive self. And so, I finally come to my point. What is this Humming Ale all about and, as a "Bold Hoppy Pale Ale" according to the packaging, how does it compare to today's toned-down Liberty Ale? In a determined evaluation, I judged them head-to-head. Both are listed as 5.9% Alcohol/Volume, and each had 7.8% residual sugars (measured by refractomer) and turbidity of 32 NTU. Each delivered the same prodigious, creamy and rocky head - although my notes describe the Humming head as more lacey and lingering. Both gave the same light straw-amber colour and fine bubbles, though, once again, the Humming sample was deemed more effervescent. For aroma, the Liberty was light hops and slightly 'cabbagey' (DMS) while the Humming was also lightly redolent of hops but also fresh laundry (ozone) in an agreeable way. The flavour of the Liberty was of cloying malt backed with bitter undertones - the finish lightly astringent. On a similar level, the Humming delivered a thin malt structure and fugitive hop bitterness, with a fleeting hint of balanced malt and hop afterness. Going back and forth brought no more comparative differences. If forced to choose one over the other, based on this one tasting, I would probably go with the Humming Ale, but in a session situation, I would probably not notice much difference between these two beers. Which begs the question, why create a "new" beer that, is apparently far too similar to an established product. Marketing perhaps? In an ideal world, I would prefer a re-launch of Liberty Ale with all its original bold, brazen, exceptional qualities, and keep on Humming for the smaller masses. Best comment ever. You should really have a blog of your own, Anonymous. Let me know if I can help!